We used to call it Greek, but not any more! Authentically Strained in the traditional Greek and Iceland style, our yogurt is high in protein and unapologetically Irish, made with fresh Irish milk from pasture fed cows, grazing outdoors for most of the year. Ireland's temperature climate and soft rains mean grass is plentiful and our cows are free to roam outdoors for most of the year. Extremes of temperature, such as those found in very hot or very cold countries, mean that cows must remain indoors for long periods. Ireland's weather is perfect for dairy. 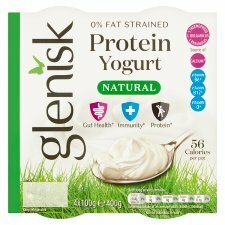 For Glenisk, this means a quality milk is transformed into a thick, nutrient-rich yogurt, high in protein and distinctively delicious.